You will be picked up in mid-afternoon from your hotel in Jaisalmer, the airport, railway station or the bus station and proceed to the Thar Desert located 45km from the city. You’ll then continue by Jeep leave From Jaisalmer. Then proceed to the camel Safari point, take the camels and ride into the desert. 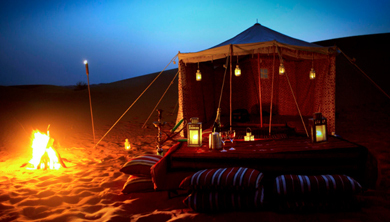 After a sunset back to dinner time, you will relax on the dunes next to a camp fire and you will sleep overnight in the Thar desert underneath the stars. Some freshly cooked snacks. After sunset, you’ll be served dinner before bedding down for the night under the light of the safari way. The next morning after breakfast back To Jaisalmer Drop Off. Camel Ride at Sand Dunes. Camel Safari Tour is enjoyed 4 pm to 7 pm or early morning at 5 am to 7 am. 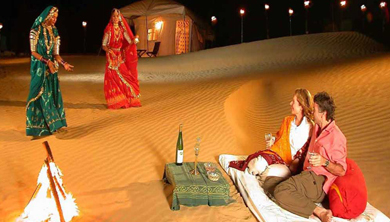 In short, the best time for a safari tour in Sam Jaisalmer is sunset or sunrise. Maximum 2 people can sit on one camel and this tour will start & finish from our camp site, the mid-point will be Sunset point. Folk dance with Dinner at Sand Dunes. 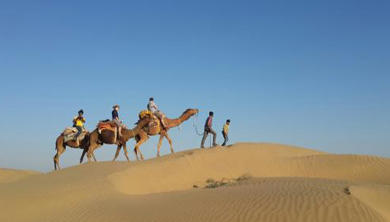 Pick-up at 4pm from hotel / airport / the train station in Jaisalmer, traveler will embark on an afternoon and sunset excursion through the Sam Sand Dunes. Venturing across the flora-free sand and sand dunes, you will be able to pause for photo opportunities, especially with the setting sun in the background. After sunset, at approximately 6:30pm, enjoy dinner at Desert Camp to firelight and Mashaals (traditional torches) while local, folk musicians and dancers entertain. Following dinner, travelers will be returned to respective Jaisalmer accommodations / Railway Station in Jaisalmer, at approximately 9pm. 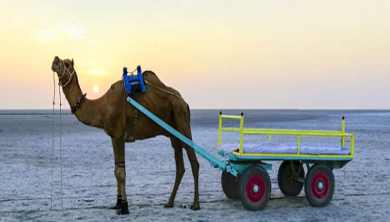 Visit of Desert National Park with Camel Cart Ride. sand grouse, desert fox and cat, desert gerbil, fringe-toed agama eagles and blue bull. Desert National Park also houses one of the heaviest flying birds in the world, the endangered Great Indian Bustard. Also Enjoy Camel cart ride. Jeep Safari at Sand Dunes. A visit to Jaisalmer is incomplete without a thrilling Jeep safari on the vast golden stretches of the Thar desert. 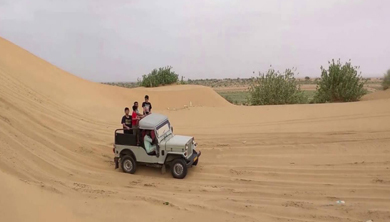 This package allows you to enjoy a 30 minute long Jeep safari on one of the best sand dunes in Jaisalmer. Sam Sand Dunes is known for its 30-60 feet tall sand dunes which make for a thrilling ride for adventure enthusiasts. 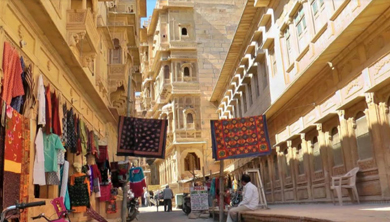 Walk through the narrow alleys of Jaisalmer. Know about the historic monuments and the stories behind them. Indulge into the culture of Jaisalmer by knowing people from the closest quarters. All the major city sights to be covered in Jaisalmer on 1 day tour in city Jaisalmer the Golden city of Rajasthan is popular for its Fort & havelis and also culture of the Jaisalmer peoples makes it special. Jaisalmer is best covered with a walking tour of the city's major tourist points which are within the 2-4 km radius. If we will travel by car or taxi then also we will have to walk as Jaisalmer streets are very narrow and cabs will not be able to enter into touristic points. You have to park your car and then move to watch the historical palaces of Jaisalmer. Tour of Bada Bagh “The Royal Cenotaph”. Bada Bagh is a magnificent garden located on the way from Jaisalmer to Lodhruva. 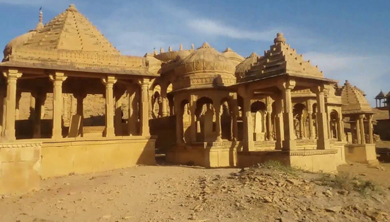 There are many 'chatris' or cenotaphs of the Maharajas of Jaisalmer at Bada Bagh. One can enjoy serene views of the sun setting beyond the sand dunes here. Behind Bada Bagh in Jaisalmer, one can spot numerous windmills, as there are a lot of wind farms in the area. One can witness three things while in Bada Bagh - a garden, a dam and a tank. A magnificent pillar, known as the Govardhan Stambh, was erected to commemorate the successful construction of the dam and the tank. There is also a famous Bhairoji Temple near Bada Bagh.